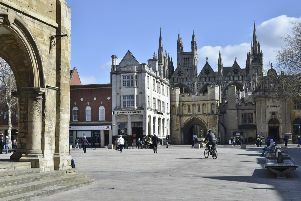 Peterborough has a new big player in the business world after Joseph Valente was crowned the winner of The Apprentice. The plumbing boss earned a £250,000 investment with Lord Sugar to grow and expand his business nationwide after a gruelling 12 week process. Joseph, who has bounced back spectacularly since being expelled from Stanground College aged 15, came out on top against 17 other candidates to secure the 50/50 partnership with Lord Sugar who decided to back his business over the dating app designed by fellow finalist Vana Koutsomitis. Sizing up which candidate to back, the peer said: “Technology has been my best friend for over 50 years. But maybe it’s time to make new friends. During the series finale things did not appear to be going smoothly for Joseph, who suffered a set-back when his plans to use renewable technology such as solar panels were said to be unworkable at the current time. But he bounced back in style by taking on board advice for his company to use smart technology which would allow people to control their thermostat on their phone or run a bath when not at home. Joseph’s re-branding of his Impra-Gas business as Prime Time Plumbers was not a major hit with people spoken to on the streets, but his vibrant, energetic pitch was acclaimed by industry experts at City Hall in London. Joseph’s pitch in the boardroom then proved equally effective. He told Lord Sugar: “I’ve got 10 years’ experience in this industry. I’m passionate and hard-working. After crowning his winner, Lord Sugar said: “Joseph is a great example of what’s possible. He turned his life around and decided he was going to go to work and here he is today. He’s well-deserved winner of The Apprentice and I look forward to him being my business partner. Joseph said from the beginning of the series that Lord Sugar had been his inspiration in business, and he impressed during the interview stage by achieving full marks on a quiz about the businessman’s autobiography, ‘What You See Is What You Get’. He said: “It has to be Lord Sugar for me. I started my business because of Lord Sugar, because of that book. It means the world to me, to be working with him. “Lord Sugar was just a normal guy. He came from a council estate in London and he just worked very, very hard.